As I stand in my backyard, an unexpectedly gentle breeze blowing on this warm August morning in South Carolina, with my indigo dyeing equipment set up and another bunch of yarn and fabric about to experience the magic of indigo, I feel at once both primitive and very modern. It is the irony of using ancient dyeing techniques in the 21st century, the juxtaposition of plastic 5-gallon buckets and rubber kitchen gloves with a dyestuff in use since at least 2400 B.C. It is the continuum of craft, of beauty, of art, of color. One aspect of the irony of MY being involved with indigo is the amount of time and patience it requires (all of which are worth it. Totally.) I'm not terribly good at waiting unless I have trained myself to see the value in the time as it passes. I can too easily get impatient for something good to happen or to get on to my next project or to finish the task at hand. Unless you have a spot that is always dedicated to dyeing in your home or yard, there must be set up time. The dye vat has to be prepped and the chemical reactions must occur (all in their own time) and the fabric or yarn must be made ready. The time in the vat itself seems like the smallest portion of the process. A mere 5 minutes in the greenish liquid then necessitates at least 15 or more minutes for oxidation. Once the dyeing part is complete, comes the soaking in vinegar, the washing, the rinsing and, in the case of yarn, the multiple repetitions of the soaking, washing and rinsing in order for the excess dye to be removed. It takes time. Learning to love indigo and to understand it and learn the lessons it has to teach, takes time. When I first began dyeing I was impressed with it, of course. Years of dyeing Easter eggs and using fabric paint and painting walls and craft projects prove that I love crafts with color as much as the next gal. But it wasn't until I kept at it and the weeks stretched into months and the months stretched into years (OK, as of now a year and a half), that I began to connect with the it. No longer is this merely a method to turn fabric and yarn blue. I could do that with a bottle of Rit Dye and have much more reliable, consistent, quick results. It isn't just about the color, because if it were, then we would only use synthetic indigo, never the natural stuff that takes so long and can be a little moody like a teenager in the summer. 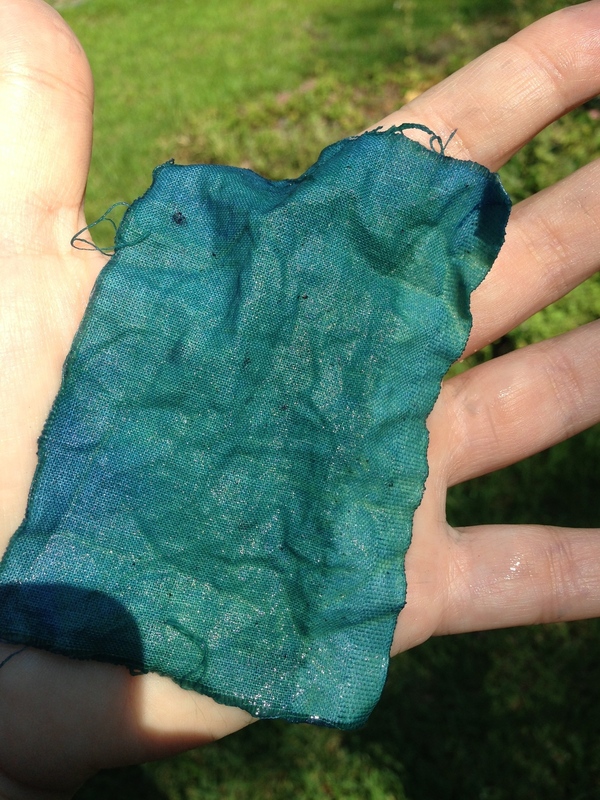 Indigo dyeing is a lot like teaching the skills involved in knitting. It is something that cannot be hurried. It sometimes takes tact and finesse and encouragement and nurturing to introduce dye to fiber or knitting to a newbie. It takes time. When I am spending time with my dye vat as I did today (and twice last week--now you know why all my house work hasn't been finished), I think about time. I think about the time it takes to dye, the time it takes to learn from indigo, and the time that has passed over the many centuries--time in which indigo was the most prized of colors, the color of royalty, the color that was traded and revered and used as medicine and currency. I am caught in the middle; I am the student, as indigo teaches me about its wealth and magic, and I am the teacher, passing on what I learn to others so that the continuum will last. It is only a moment of time, yet it is my moment with indigo and as the sun comes over the giant, moss-draped Live Oak next door, it shines on my moment, on my modest place in the rich history of this dye stuff, and I am changed as surely as the fibers in my hands are now a deep, dark blue.